We have already seen cool resources to download free 2010 printable calendars. If you do not want to download pre-made calendars and want to make customized calendar as per specific requirement, then make them online at Calendar Labs. 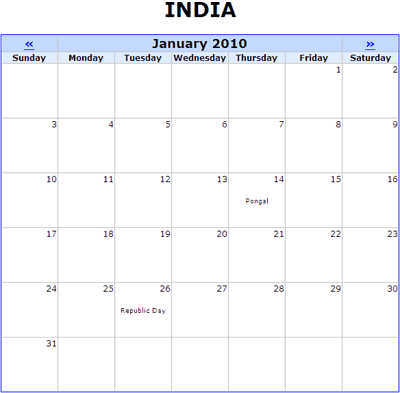 It is an online tool to create country specific printable calendar with holidays. 1. Open Calendar Labs website in the browser. 2. Select Month and Year for the calendar. 3. Then select Country from drop down box. 4. Tick options to include Holidays (and include week number). 5. Click respective buttons to see yearly or monthly calendar. 6. Click “Show Printable Format”, a new window will open with calendar preview. Goto File > Print (or press Ctrl + P) to quickly print your custom calendar. As seen above, final calendar is simple but useful with country specific holidays listing. Similarly you can generate full monthly and yearly calendar for any year displaying holidays from different countries. Ready to make and print some calendars?